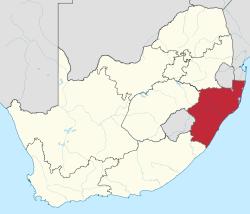 KwaZulu-Natal (Zulu Kingdom), , is a province in the east of South Africa, bordering Mozambique in the north and the Eastern Cape in the south. Battlefields -- Inland area that saw many conflicts between the Zulu, British and Boer forces. Elephant Coast -- Very poor rural communities live in this wonderland, which is home to the iSimangaliso Wetland Park as well as Ndumi Game Reserves, the superb Lake Sibaya, Sodwana Bay the delightful Kosi Bay Nature Reserve and a host of many smaller nature reserves and private game lodges. Mostly untarred roads and beautiful nature. The Elephant Coast is the brand name for the Umkhanyakude district Municipality which consists of 5 local municipalities and a District Management area. Midlands -- Undulating grassy downland with countless hills and rivers. Spectacular scenery, great fishing and canoeing, narrow gauge railways, excellent camping and caravaning. North Coast -- Spectacular and easily accessed beaches and good holiday resorts. Sugar-cane country, Zulu history, surfing, microlight flying, deep-sea fishing, dolphin viewing. Excellent climate year round, the waters flowing down the coast rarely being less than 25 Celsius. South Coast -- A 160 km stretch of sub-tropical forest and beaches, dotted with holiday resorts, stretching from Durban as far south as Port Edward. Includes three notable nature reserves (Vernon Crookes, Oribi Gorge, Umtamvuna). Well known for the mid-winter sardine run. Ukhahlamba Drakensberg -- Massive and spectacular mountain range. Peaks exceed 3000 meters above sea level. Climbing, hiking, wilderness trails, mountain biking, fly fishing, and more. Zululand -- Hills, valleys, and historic battlefields. Hot and humid along the coast, cooler and wetter inland. Game reserves include the Hluhluwe-Umfolozi Park. Richards Bay is a major port for the export of coal and minerals and home to a massive aluminum smelter. Durban - named in 1835 in honour of Sir Benjamin D’Urban, Governor of the Cape. Excellent beaches and surfing, 3 km Marine Parade, yachting harbor. South Africa’s main cargo port. Sub-tropical, often sultry and hot. Strong Indian influences. Eshowe - the oldest town of European settlement in Zululand. Good base to see the Zulu culture. Inland, cooler than Durban in summer. Pietermaritzburg - dating back to 1838, the original capital of the Voortrekkers’ Natal. Rich in history, a warm and well watered climate, good boating, canoeing, fishing, scenic drives, and beauty spots. Bushmen hunters were among the earliest people to explore the region, which offered them plenty of caves and rock shelters, clear waters, abundant firewood, and good hunting. The bushmen were ejected by the Iron-Age Bantu who migrated down from central Africa in the early 1600s. They called themselves the Nguni after their leader, and they were followed by an even larger number of people speaking their same Nguni language. They decided the region was much to their liking. Worth fighting over, in fact, which their clans did with great energy. The Zulu clan under Shaka Zulu welded other Nguni clans together into what became the most impressive military force ever seen in Africa’s history to that time. Generally, the people enjoyed a good life and were wealthy in terms of the cattle they owned. Europeans arrived in two ways. The Afrikaners trekked from the Cape and entered the region from the west. The English arrived at Port Natal (Durban) in the east. At first, there was little tension between black and white. But the Africans had no reason to work for the newcomers, so when sugar became important in the second half of the 1800s, the English imported labour from India. The Indian population grew quickly and by the 1890s outnumbered the whites in Natal. The English soon soured relations between black and white by insisting the Zulus should give up their traditional military system. War followed in 1879, and after scoring a massive victory at Isandlwana, the Zulus soon lost too many men - at least 4000 - and too much heart to continue. Twenty years later and war flared up again, this time between Afrikaner and British, and again the British suffered humiliating defeats at the hands of smaller and poorly trained forces, especially in Natal. The war dragged on for more than two years before the Afrikaners sued for peace. They ultimately had their revenge, however, by winning political mastery of the entire country, which was in their grips from 1948 through 1994, when the African National Congress under Nelson Mandela came to power. Today it is fair to say that the Natal African is at the bottom of the Province’s economy and poorer than ever, apart from those few who have become enriched by the current political dispensation. The Indian community in KwaZulu-Natal, although victimized by apartheid, includes many of the wealthiest people in the country and still outnumbers the whites. As far as race relations are concerned, strong feelings simmer beneath the surface, especially between African and Indian. Indeed, contemporary Black musician Mbongeni Ngema wrote and recorded a song, AmaNdiya (the Indians), that was ultimately judged to be hate speech. 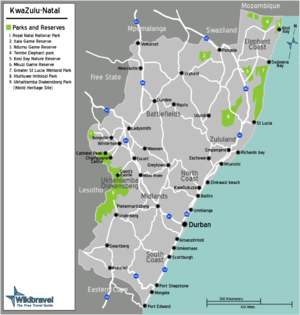 Most visitors to KwaZulu-Natal begin or end their journey at Durban. The only important airport of KwaZulu-Natal is in Durban. It is the province's largest airport and offers domestic and international flights (including a number of new routes to East Africa and the Middle East). The old Durban airport was closed at the end of April 2010 when a new airport, King Shaka International, opened on 1st May at La Mercy, 35km north of the city. If you’re flying in to Durban, book your rented car beforehand. If you’re arriving on a late flight, book Avis and ask them to keep their kiosk open until you arrive. They are happy to comply. The N2 connects KwaZulu-Natal with Mpumalanga, Limpopo, Eastern Cape and Western Cape. If you are driving from the Kruger National Park to Durban, the N2 between Piet Retief and Pongola is often badly pot-holed. You might do better to travel by way of Middelburg, Ermelo, Volksrust, Ladysmith, and Pietermaritzburg. If you are driving to Durban from the Cape, the stretch through the Eastern Cape from East London onwards is hardly worth the bother and can be unsafe in and around Umtata. Better to drop off your rental at Port Elizabeth, fly to Durban, and rent again. The N3 connects KwaZulu-Natal with Gauteng via Van Reenens pass. If you are driving through Swaziland, cross into South Africa at Golela and get onto the N2 southbound. Great lengths of the N2 (coast) and N3 (Johannesburg-Durban) are toll roads. You can pay at the toll plazas with a credit card, but cash may be wiser from the point of view of card fraud. The main companies run regular buses from Durban to Johannesburg and Port Elizabeth. Public transport east of Durban is limited. The Baz Bus, , runs from Port Elizabeth to Durban (a compulsory overnight stop) and from there to Johannesburg via the Drakensberg. Durban is linked to Johannesburg by rail, almost daily overnight, and once per week to Cape Town; trains are operated by Spoornet . There are some long-distance bus services, between Durban and Johannesburg for example, but as with the rest of South Africa local public transport is not a good option for tourists. Africans get about on minibus taxis, but these run on set routes, are generally not roadworthy, and are very difficult to understand. You’ll find a couple of international car hire brands including Avis, and there are a few trustworthy local firms including Tempest. The bigger the name, the more likely you are to find a branch in the nearest town, which is important if you have problems with the vehicle. You should take care to understand your liability in the event of damage to the vehicle; even if you are entirely blameless, you will probably have to pay towards the cost of the repairs. Taxis do not rove in Durban, so the best is for you to call their offices. A lot of taxis also operate from most hotels, so that may also be an option to find one if you are in a hurry and close to a hotel. There is a Metrorail suburban rail network around Durban and the North and South Coasts, and inland to Pinetown. However, it is generally not thought of as safe, unless you are in a large group (going to a sporting event, for example, at Kings Park rugby stadium, Moses Mabhida soccer stadium, or Kingsmead cricket ground). The second highest waterfall in the world, the Tugela falls, located in the Royal Natal National Park. The museums and historical sights regarding the Anglo-Boers wars around Ladysmith, Spioenkop, Frere (where Winston Churchill was captured) and many other sites. Explore Zulu culture in the Valley of 1000 hills. Enjoy the beaches and warm water of the Indian Ocean. Visit any of the many national parks. Scuba diving, especially at Sodwana Bay, Aliwal Shoal, Mabibi and Kosi Bay, and Durban. Since the province has such a strong Indian heritage, it’s a good idea to try the local Indian restaurants. At Jai Pur Palace in Durban, try the eat-all-you-like buffet and sample as many of the dishes that tempt you. Well worth it. At the other end of the culinary scale is bunny chow, a loaf of bread hollowed out and filled with curry. Be careful - food hygiene may be poor where bunny chow is sold. If you are staying at B&Bs, your hosts will know where you can get a good meal. The newer shopping malls generally have a good choice of reasonable eating places; most towns have international fast-food franchises. The general South African safety rules apply in this province. A particular menace in KwaZulu-Natal is credit-card fraud. Keep your card in sight at all times, always check that the card returned to you is your card, and check your card statement when you get home.